The highest military rank to have been achieved by a Lawrence County resident is that of a four star general, held by General William Vincent McBride who served as the second in command of the United Sates Air Force. Born in Wampum, Pennsylvania on May 25, 1922 to Mr. & Mrs. Vincent R. McBride, he attended Wampum High School and Garfield Business College. He was working as an accountant when World War II broke out, enlisting in the Army in May 1942. The new aviation cadet received his training at Maxwell Field, Alabama and at the New Army Air Forces Pre-Flight School at Monroe, Louisiana . He went on to the University of Miami (Florida) graduating as a Lieutenant. Group of Pittsburgh area air cadets. McBride is 1st on left seated at the table. McBride’s first assignment was at Carlsbad Army Air Base in New Mexico where he trained as a bombardier. He was then sent to Tampa, Florida at Lakeland Army Air Base. He became a triple rated officer – pilot, navigator and bombardier. A year later he was a squadron navigator with the 387th Bombardment Group serving on board a B-26. 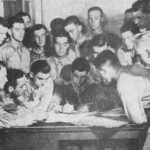 Rapidly rising through the ranks due to heavy war losses in the Group, McBride rose to the challenge. Within five years of enlisting, he decided that he was going to make the military a career. As a pilot, McBride served in the Military Airlift Command, Weather Reconnaissance and Air Rescue. In 1952 Col. McBride assumed command of the Second Air Rescue Squadron on Clark Air Force Base in the Philippines. He also served on Okinawa. 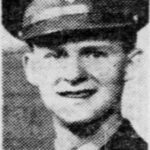 William Vincent McBride is a holder of the distinguished flying cross, air medal, fourteen oak leaf clusters (Air Medals) and the French Cruix Deguerre with palm. He was nominated for Brigadier General in September 1965. As Commander of the 437th Military Airlift Wing at Chalreston, South Carolinam he received the distinguished meritorious service award for his unit’s performance. McBride was selected as Military Assistant to the Secretary of the Air Force and also commanded the U. S. Air Force in Europe. In September 1974, McBride was promoted to a four star general. 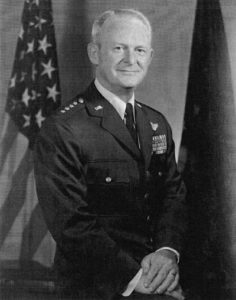 By September 1975 McBride was the Air Force’s Vice Chief of Staff at the Pentagon, the second highest position within the Air Force. He retired in 1978 after 34 years in the service. McBride attributed his rise in the ranks from private to general to his hometown of Wampum, stating that being raised in a small town gave him an appreciation for basic values very early in life. Honored by the County in 1977, his name was placed on a plaque at the Lawrence County Court House along with three others from the county who achieved high rankings in the military. Wampum also honored him in 2002 with a bench and plaque placed on the North Country Trail where it passes through Wampum. McBride married Kathryn A. Solsberg and the two were living in San Antonio, Texas as of 2015.